“The government’s been shut down for, like, a month and I spent two hours at TSA in Atlanta. They thought I was smuggling extra teeth in my mouth,” explained Kenan Thompson’s Steve Harvey, who was filling in for the show’s normal host, Howie Mandel. Thompson’s Harvey then brought out Baldwin’s Donald Trump to play. Baldwin’s Trump explained that he wants $5 billion for his border wall. He then met the members of Congress who were holding “Deal or No Deal” briefcases of counteroffers. 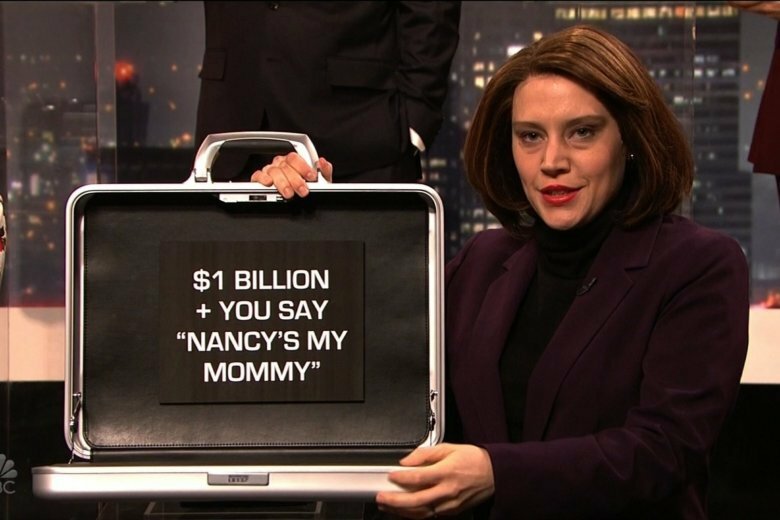 The fake Trump kicked off the game by choosing “Fancy Nancy Peloser,” a nickname for Speaker of the House, Nancy Pelosi, who was played by Kate McKinnon. “Deal or No Deal” continued as Baldwin’s Trump picked others from Congress such as Alexandria Ocasio-Cortez (played by Melissa Villaseñor) and Mitch McConnell (played by Beck Bennett) before landing on a Clemson football player. The Clemson football player, played by Pete Davidson, didn’t have a briefcase filled with a counteroffer but rather a case of hamburgers or as he called them “hamberders.” The scene referenced the national champion football team’s recent visit to the White House, during which they were served fast food. President Trump later mistakenly referred to the meal as “hamberders” on Twitter.